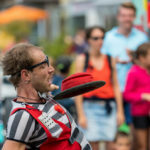 From Thursday 9 August until Saturday 11 the streets of Bern’s Old Town will be alive with 150 musicians, clowns, puppeteers, actors, dancers and other performers from 25 countries. Plus lots of tasty international food. 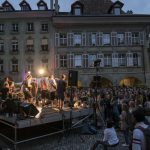 The 15th annual Buskers Bern Street Music Festival, entitled Lunatic Lights, begins Thursday night and continues Friday and Saturday spread across 25 venues. The first night shows how the festival turns the Old Town into a colorful circus of wild and wonderful music and performance. Hungry and thirsty festival goers will find dozens of stands selling international street food, and most of the Old Town restaurants are open for those who prefer some calmer off-street seating. The festival even has its own specially brewed beer. The entertainment includes walking acts, street performance, acrobatics, dance, theater, comedy and installations. In addition, there will be a swarm of three five-meter-long dinosaurs and live music vehicles. 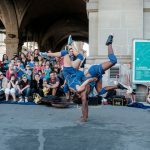 This, the largest street buskers festival in Switzerland is the brainchild of two sisters, Christine and Lisette Wyss, who still run the festival 15 years later. “The combination of us two was ideal”, says Christine, a former school teacher, now the festival’s director. Initially the sisters’ interest in street festivals was due to Lisette’s background as an international street musician (she toured Europe with an all-female saxophone quartet). Then Christine went to the Swiss international exposition in 2002, and decided to study festival management. She now holds a master’s degree in Cultural Management. The festival has steadily grown each year since. Attendance in 2015 was about 70,000. At the end of 2017 the festival’s founders handed over management to Jacqueline Schnyder and Julia Geiser. 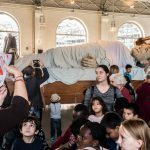 The performers are not paid by the festival, though they receive free room and meals while in Bern, plus some funds for transportation. But any fees come from the generosity of their audiences when the hat is passed around. They must do OK because in 2106 the festival organizers had to turn away 750 acts that wanted to perform here. The festivities continue on Friday and Saturday nights. It’s an ideal year to experience Switzerland’s biggest and best street music festival.